Natureways Safaris (Pvt) Ltd was established back in 1987 by the legendary guide Garth Thompson who had over 20 years experience in canoeing and walking safaris. His protégée James Varden then bought Natureways in 1997, James who is still a Director and guide of Natureways has established himself as one of Southern Africa’s leading guides. In an effort to offer the best African wilderness experience Natureways Safaris merged with Shearwater Canoeing Safaris in 2004. 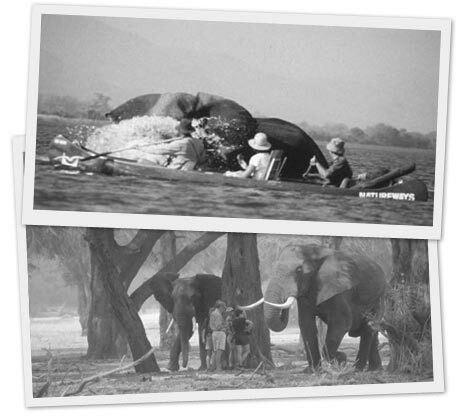 This merger enabled Natureways to offer both our luxury mobile safari camps ‘Odyssey Safaris’ and our expeditionary style canoe safaris ‘Explorer Safaris’. Natureways Safaris has always been and will continue to be an owner run company, offering the hands on dedication and commitment of all its owners. We pride ourselves on offering personalised Safaris that can be tailored to each and every guest’s desires. We have support teams in Harare, Kariba and Mana Pools National Park. Our team is diverse but we all have the same passion for the African bush and its wildlife. Natureways Safaris has a strong belief in sustainable, eco-friendly tourism and conservation, which will allow our guests to continue to experience the real flow of Africa for many years to come!